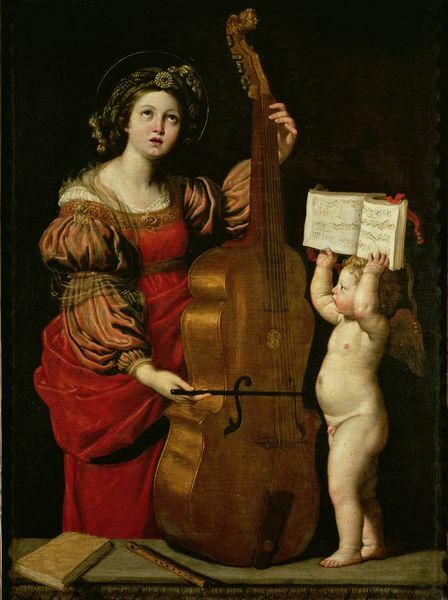 In late 17th century England, 22 November was a grand occasion with celebrations in honour of St Cecilia, patron saint of music. 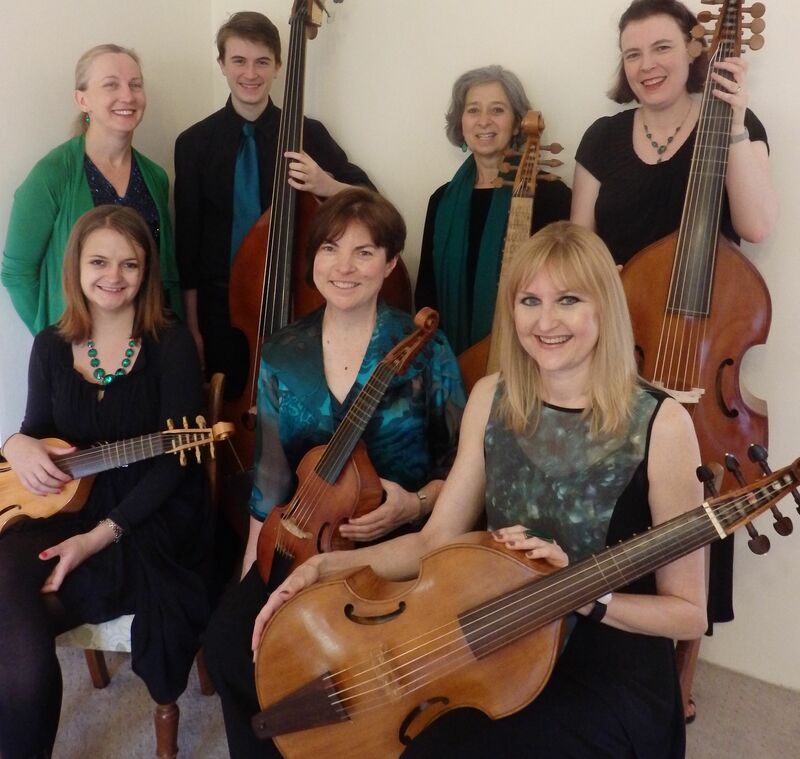 Hear some of Purcell’s chromatically luscious arias and instrumental music now arranged with viols, along with one each of his 3,4,5,6 and 7 part works for viol consort. We also present Monteverdi’s heart rending Lamento d’Arianna and more settings of Dorothy Porter‘s wonderful poetry with premieres by Brooke Green. $35 and $25 concession, available at the door and through Glebe Music Society. In our next concert we celebrate Jeanne d’Arc and Dorothy Porter with music from the 15th and 21st centuries by Dufay, Agricola, Elena Kats-Chernin and Brooke Green. Mosman Music Club, Blessed Sacrament Church, 59 Bradley’s Head Rd, Mosman, Sydney. In 1429, with a divine calling, an uneducated peasant, the 17 year old Jeanne d’Arc led the French army in several routs against the English and Burgundians. We begin with a setting of Christine de Pizan’s Ditié de Jeanne d’Arc, and trace the history of Jeanne’s life with music from the 15th century by Dufay, Dunstable, Agricola and Josquin. Dorothy Porter (1954 – 2008), was one of Australia’s greatest poetic visionaries, inspiring Brooke Green to set some of her Bone-Burning Tunes including her mesmerizing Emerald Leopard. 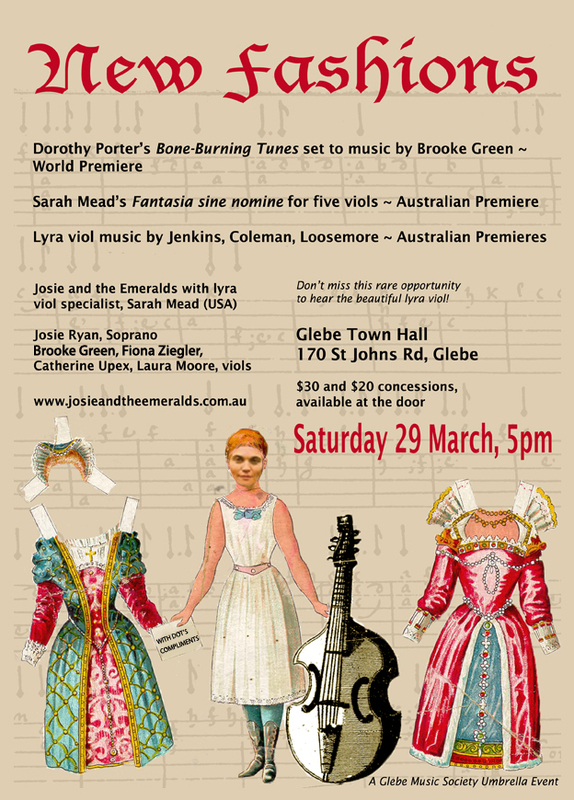 Continuing their mission to present contemporary as well as rare gems of early music, Josie and the Emeralds will also perform music by Elena Kats-Chernin and Arvo Pärt, and Brooke Green’s Graceful Ghost as heard on ABC Classic FM. $30 and $20 concession, available at the door. Today Josie and the Emeralds continue the tradition of embracing the new while celebrating the old. Their forthcoming program, “New Fashions”, with guest artist Sarah Mead, brings the glorious lyra-viol to the stage in combination with voice and strings, with exuberant pieces reflecting the crazes of 17th-century England (including the ubiquitous bells), as well as new pieces fresh from their 21st-century imaginations.